Two of the most amazing sweet breakfast treats combine in this super easy French toast recipe: banana bread and French toast. We love making banana bread with leftover bananas. It's a great way to avoid food waste, plus it's super tasty. We tend to gravitate towards one of our favorite, spiked recipes: bourbon banana bread because it makes for a super moist and very flavorful bread. But, of course, any banana bread will do. The French toast part of the recipe is very simple: eggs, milk, and a little sugar and vanilla. The bread itself has so much flavor, so you don't need to spice up the egg mixture. Of course, you can spice up the egg mixture if you like. Normally, you can find French toast with cinnamon or a little nutmeg. 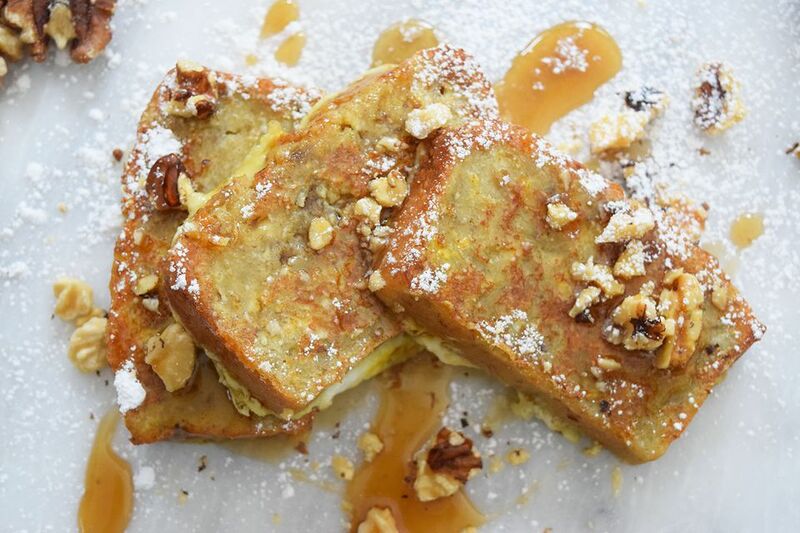 Some great additions we like to add to the top of our French toast include powdered sugar, real maple syrup, and walnuts. If you don't have any banana bread, you can always use any other kind of quick bread, like a chocolate chip or zucchini bread. Either would work wonderfully with this recipe as well. It's important to have your oven at a nice warm temperature of about 250 F. This way while you are cooking the batches of french toast, you can keep the already cooked pieces warm. Just place the already cooked pieces on an oven proof plate or pan lined with parchment paper. Don't worry, they won't dry out int he short amount of time it should take you to finish cooking the rest of the French toast. If you aren't in the mood to make a batch of French toast from scratch in the morning, try making this gingerbread French toast bake or a Bananas Foster French toast casserole the night before. Both are great ways to have the most important meal of the day already prepared before you even wake up. After cutting the banana bread, beat together the eggs, milk, salt, sugar, and vanilla. You may also add a teaspoon of cinnamon if you like. Heat a griddle or a large, heavy-bottomed skillet on high heat. Spray with non-stick cooking spray or add a tablespoon of butter. Dip a few pieces of the banana bread into the egg mixture, coating both sides. Place the banana bread facing down on the hot griddle, turn the heat to medium-low (this helps prevent the french toast from burning or caramelizing too quickly). Cook for about 2 minutes per side. Remove and keep warm in a 250 F oven. Repeat the cooking with the remaining pieces of banana bread. Serve the warm banana bread with a sprinkling of powdered sugar, a drizzle of maple syrup, and a dash of walnuts.